The Imperium Building in Reading was undergoing a full internal refurbishment, including repositioning of the lobby reception desk in front of the main east-facing glazed faade. 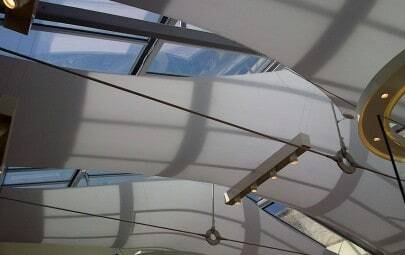 This created issues of glare from direct sunlight and was a health and safety issue for the receptionists working within the lobby. 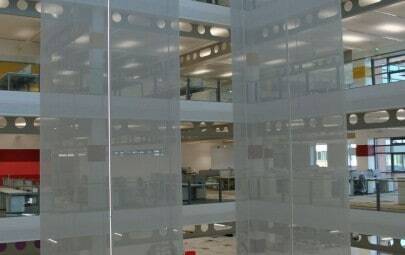 There was also a concern regarding overall light levels in the main atrium space, and with further direct sunlight ingress into internal office spaces. The owners of the building also wanted to create a bold architectural statement around the main entrance to the building, so Architen Landrell was drafted in to see whether a solution could be found that satisfied both design briefs. Architen Landrell was initially asked to undertake a sun path analysis to project the trajectory of the sun and therefore its impact on the working conditions. Once it was established that glare was likely to be a problem, we were asked to propose a design to counter this problem while at the same time adding architectural decoration to the main lobby. 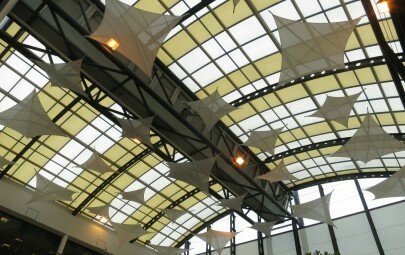 There was an original design scheme involving large tensioned tri-sails, but an initial survey of the space highlighted the large lateral loads that would be transferred to the building structure, requiring considerable disruption involving removal of internal walls to expose the structure beneath. 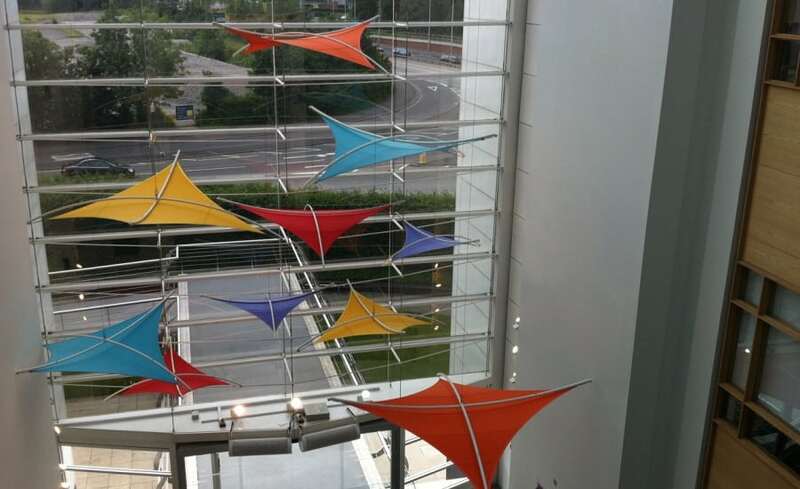 It was therefore agreed that a series of kites suspended directly from the roof support steelwork would be the most workable solution. The report provided by the sun path analysis was invaluable in providing data on where shading was needed and how much coverage was required. We originally specified a certain amount of hypars and banners in the design to resolve the issue with solar glare. However, to provide a more economical solution and for aesthetic reasons the banners were removed from the scheme by the client. They may eventually be reintroduced as the light levels in the space are monitored over the coming year. 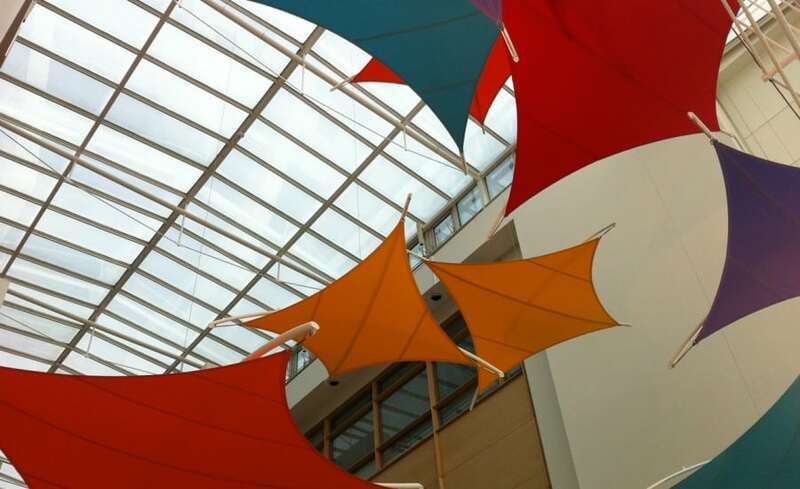 The client specified that the sails should be brightly coloured, however, the typical range of fabrics used for these kites did not provide the range of vivid colours required. 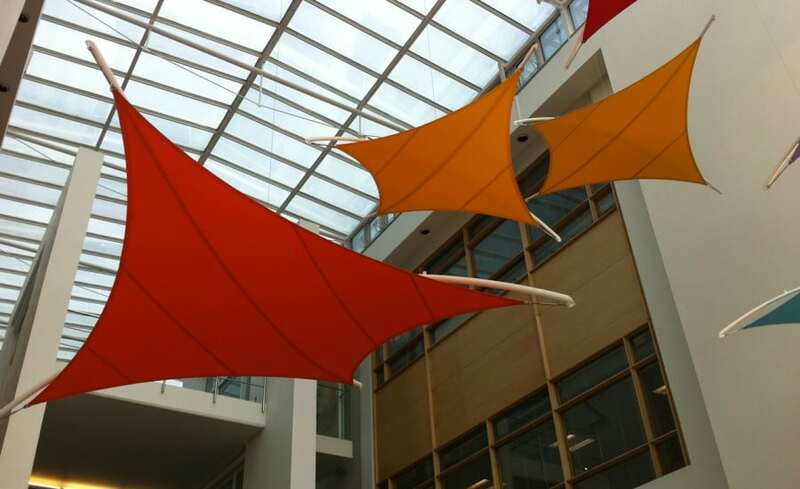 Instead we sourced a Kayospruce fabric which provided the right colours and translucency for this project. 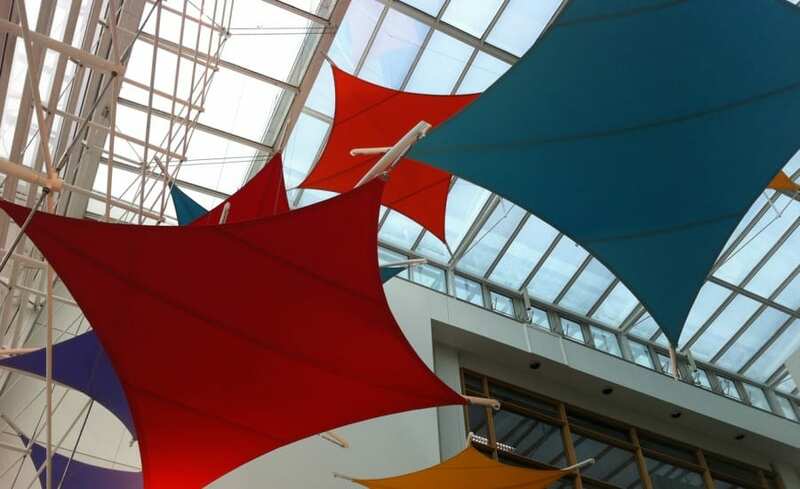 Although a fabric we had never previously used for this purpose, it proved a great success and has allowed us to offer a wider variety of colours on future projects.